The new Cole Sucker Punch created for InFamous 2 wasn't well received, so he's off the island. 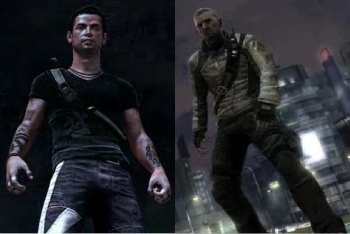 When we first saw InFamous 2 earlier this year, Cole, the game's hero, had a new look. It was so different, in fact, that fan outcry has apparently made developer Sucker Punch decide to change his appearance back to something fans should recognize. I didn't mind Cole's changed look, though his new jeans were very fashionista. There's no denying that InFamous 2's Cole was hard to compare to the original, looking like more of a bad boy with longer hair and tattoos whereas the original had a shaved head and looked like a nice young man (unless you brought him to the dark side by killing innocents). According to reports out of Comic-Con, fan feedback has nixed the new look, with Sucker Punch remodeling Cole to something more familiar. In a very James Bond-like situation, IGN received a "manila envelope" with images of the new-old Cole and said that "he looks more like the person we played as in the original InFamous and less like the man who was in all of those E3 screens and videos," but no official images have been released yet. I'm not sure the look mattered all that much, at least it didn't to me, and it seems like it would be a fair amount of work to change Cole depending on how far along development was on cutscenes and whatnot. I guess fans were pissed off enough to make it worth it. Sucker Punch has said it wants InFamous 2 to be very good and on par with something like Uncharted 2, so maybe it doesn't want there to be any hitches. Still, can't a guy grow his hair out and get a few tattoos without getting criticized?